Adorable. Just look at them. Clockwise from the top, that’s my dad, the one who you can only see his eyes; cute Nana right below him; my Auntie Anne in her fabulous cat-eye glasses; the baby Auntie Jill; right above her is 2nd oldest Uncle Bill; then above him is Boppa. It’s straight out of Nick at Nite. The family on an outing, and from the looks of it, Golden Gate Park, but really I have no idea because no one wrote on the back of the picture where it is, and it’s too late for me to call and ask anyone. So Golden Gate Park it is. It always amazes me how dressed up people used to get to go anywhere. The girls’ ankle socks are just darling. It kind of makes me jealous, but also sorry for them. There’s just something good about getting dolled up. But then again, there’s a lot to be said for blue jeans. And, speaking of, the subtitle of this recipe, as you can see below, is Messy Jeans. I am totally and completely grossed out by this name. It sounds like someone crapped their pants. But I think what it really means is that if you don’t eat over your plate, you’ll have messy jeans, because the sloppy joe stuff will fall into your lap. 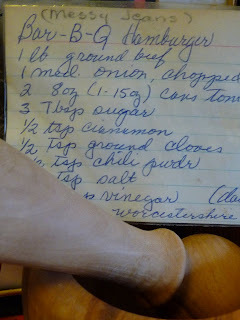 This recipe was procured from Aunt Kay, Nana’s sister. They swapped a LOT of recipes, so many that I’m not exactly sure which are Nana’s and which are Kay’s. But that’s neither here nor there. Nana and Aunt Kay both had 4 kids and were busy ladies so this was probably a good recipe to get the kids something for dinner quickly, while making sure it was filling and good for them. First off, brown the ground beef. Then toss in the onion and cook until softened. Season with salt and pepper. Add in the garlic and cook another minute. The recipe doesn’t call for garlic, but I thought it ought to be in there. Suit yourself. Next up is an interesting combination of spices: ground cloves, cinnamon and chili powder. Stir through and cook for another minute. Next up is the sugar and all of the liquid ingredients. This is something I added too. The recipe calls for 2 8-oz cans of tomato sauce, but I used a 15-oz can. It didn’t look quite saucy enough so I added some Heinz Chili Sauce. You could just use a bit of regular ketchup too. 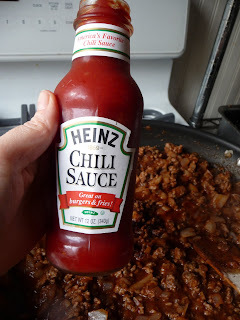 I think if you decide to use the chili sauce or ketchup you should omit or reduce the vinegar, since there’s vinegar in the sauce. Just put it in to taste. 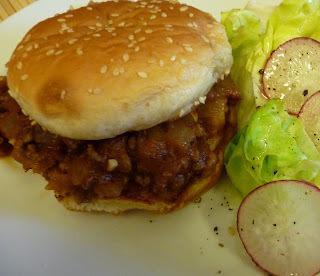 Stir it all together and you get your Bar-B-Q hamburger, aka Sloppy Joe. AKA Messy Jeans. You’ll want a toasty bun to put this on so that it’s not just a big sponge. 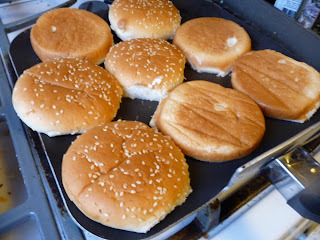 Butter the inside of your hamburger buns. And put them, butter side down, on a hot griddle or fry pan. Just till they’re browned. Leave the outside of the buns untoasted. Spoon the hamburger mixture on and put a lid on it. Make a salad or some other vegetation and you’re good to go. And guess what? It was! 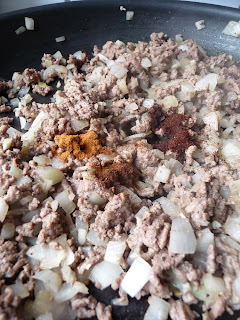 Nana's Bar-B-Q Hamburger, AKA "Messy Jeans"
Brown onions and ground meat together, add remaining ingredients and simmer 5 minutes. 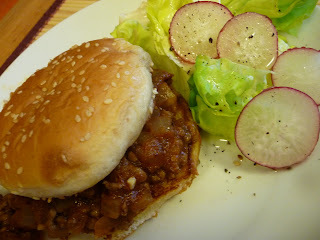 Serve over hamburger buns. 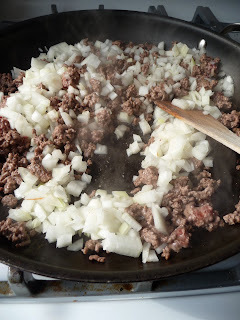 Brown ground beef first, then add onion until softened. Season with salt and pepper. Add the garlic and cook 1 minute. Add the spices and continue to cook another minute. Add the sugar and liquid ingredients. 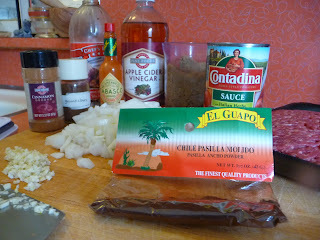 Add the chili powder or ketchup, if desired. 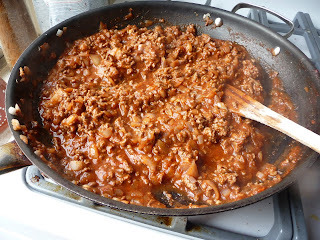 Simmer for 5 minutes until hot and the meat is tender. 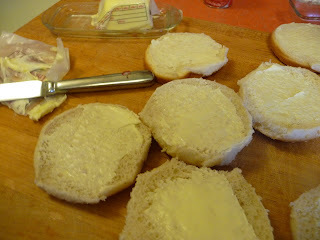 Spread the insides of the hamburger buns with a small amount of butter. 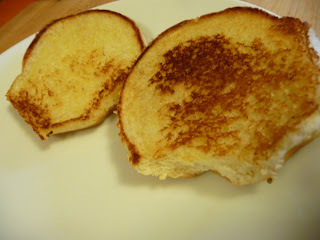 Place the buns, butter side down, onto a hot griddle and toast until browned. 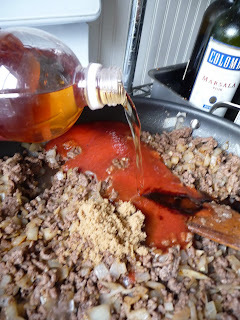 Spoon hamburger mixture over the bottom bun and top with another bun.